gions of patients with dementia of Alzheimer type. dementia in the majority of developed countries [1-5]. 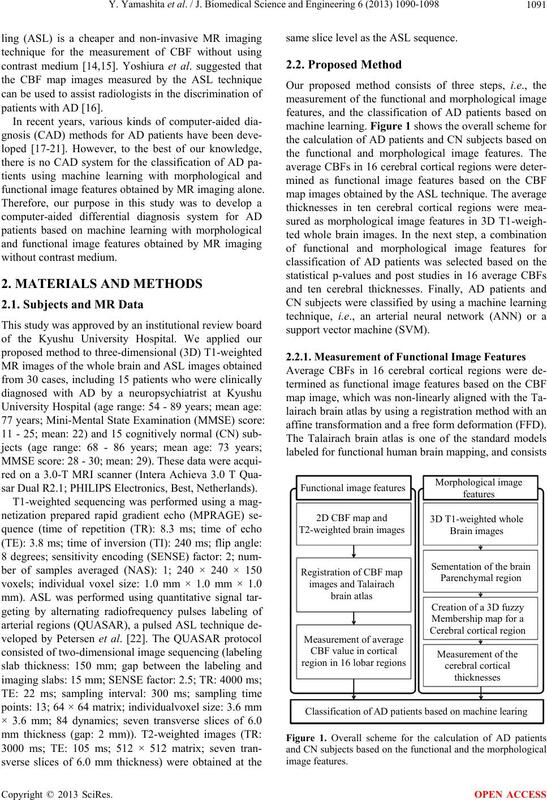 functional image features obtained by MR imaging alone. sar Dual R2.1; PHILIPS Electronics, Best, Netherlands). same slice level as the ASL sequence. affine transformation and a free form deformation (FFD). 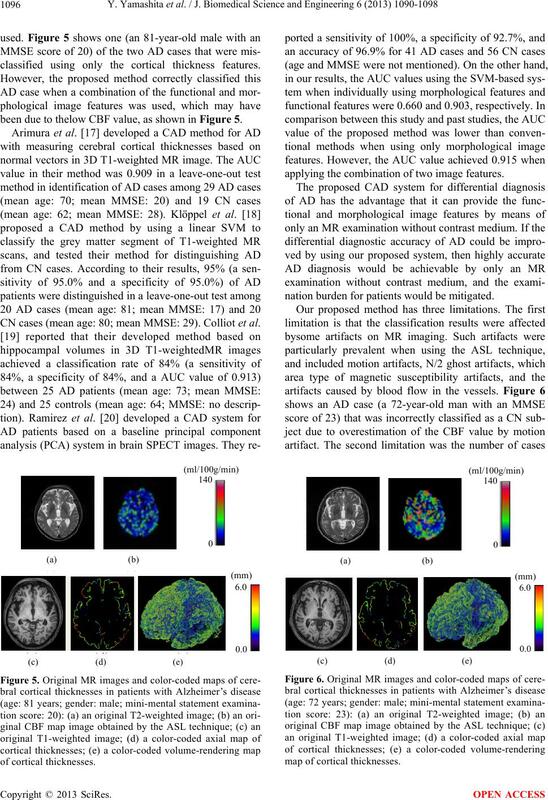 through the corresponding T2-weighted brain image. CBF values in 16 cortical regions. registration, where the average CBFs were measured. normalized for the training and testing of the classifiers. and the maximum number of iterations was set as 200.
maximum number of iterations was set as 100,000.
the effect of the image features. 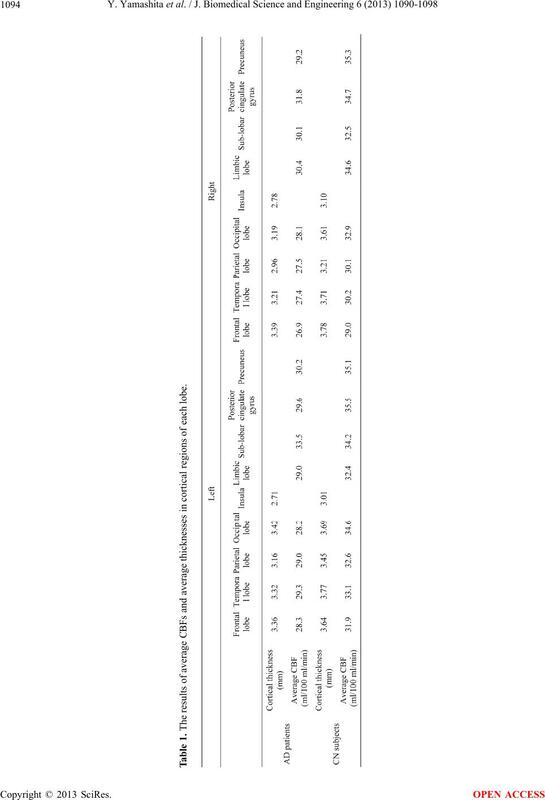 lobe were estimated with the Student paired t test. temporal lobe were overlapped in their feature spaces. Table 1. The results of average CBFs and average thicknesses in cortical regions of each lobe. frontal lobe (a) and temporal lobe (b). temporal lobe (p < 0.05) (b). right insula (p < 0.05). functional features were 0.878 and 0.903, respectively. 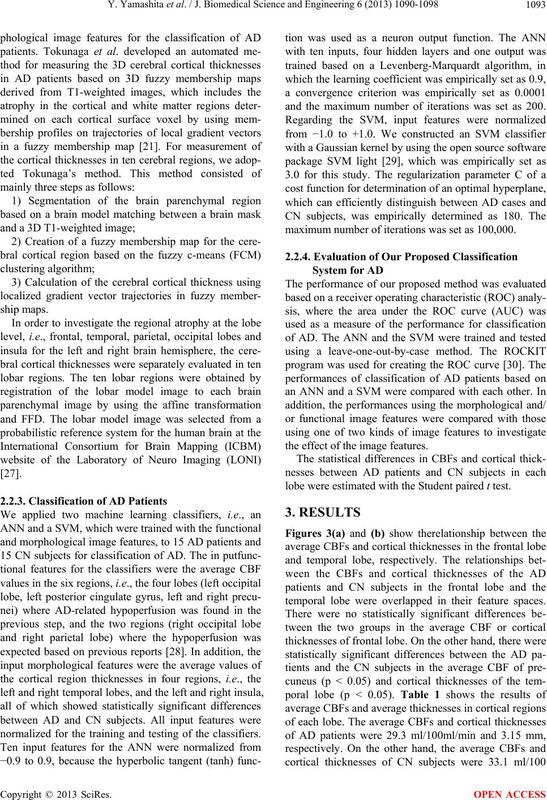 classified using only the cortical thickness features. 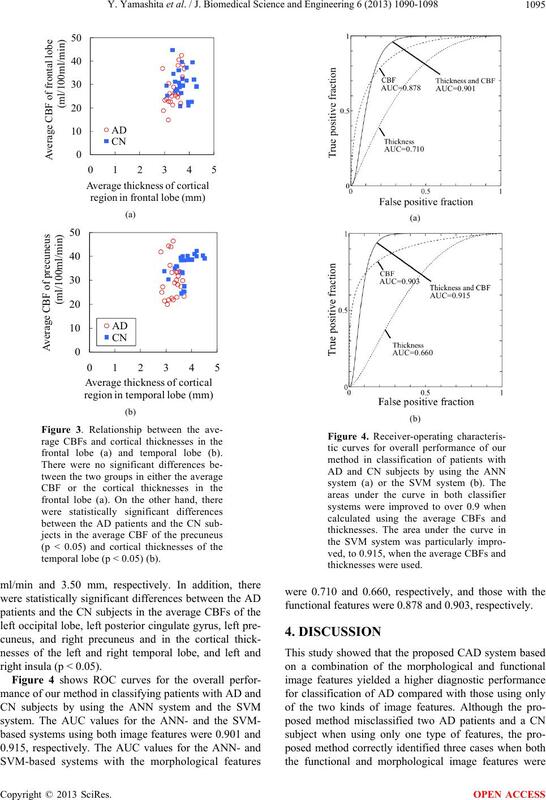 been due to thelow CBF value, as shown in Figure 5. CN cases (mean age: 80; mean MMSE: 29). Colliot et al. 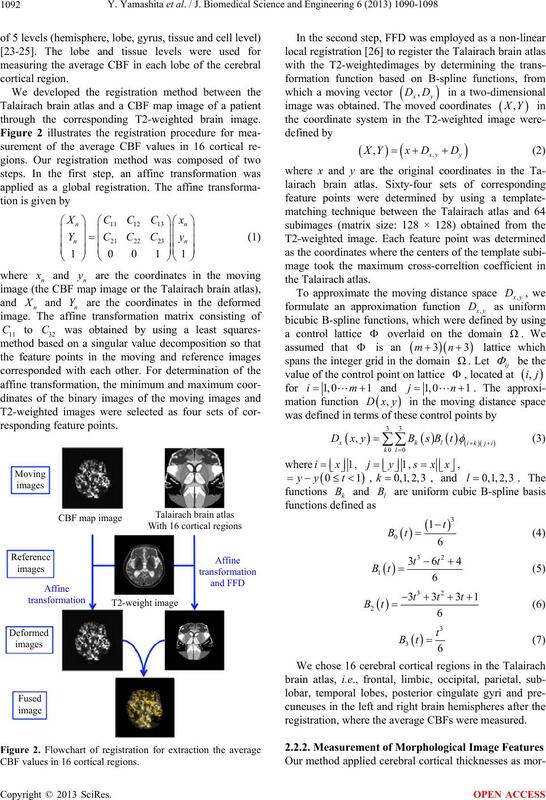 applying the combination of two image features. nation burden for patients would be mitigated. morphological and functional image features. Report 2006, Working Together for Health. analysis of MCI progression in the ADNI population. Catriona, D.M., David, C., Stephen P.M. and A. Peter P.
erly Japanese population. Neurology, 45, 1161-1168. Progress or profit? Nature Medicine, 12, 780-784.
study. 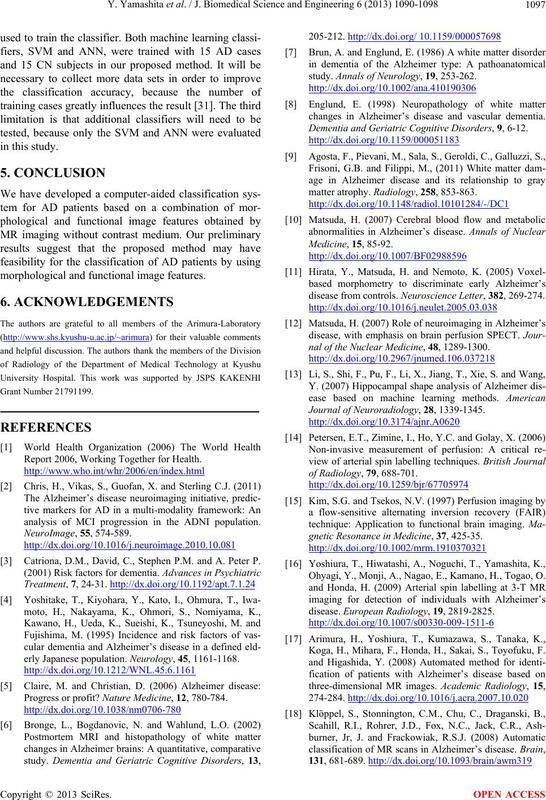 Annals of Neurology, 19, 253-262.
changes in Alzheimer’s disease and vascular dementia. Dementia and Geriatric Cognitive Disorders, 9, 6-12.
matter atrophy. Radiology, 258, 853-863.
disease from controls. Neuroscience Letter, 382, 269-274.
nal of the Nuclear Medicine, 48, 1289-1300. 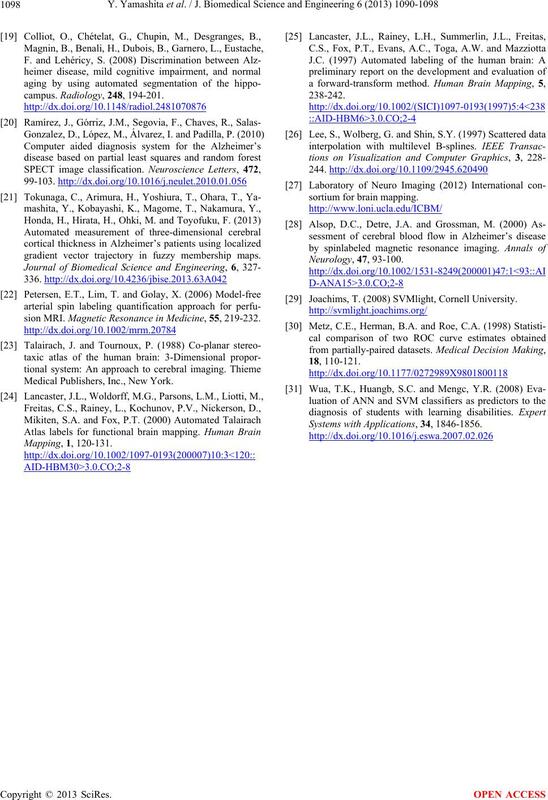 Journal of Neuroradiology, 28, 1339-1345.
gnetic Resonance in Medicine, 37, 425-35. Ohyagi, Y., Monji, A., Nagao, E., Kamano, H., Togao, O.
disease. European Radiology, 19, 2819-2825. Koga, H., Mihara, F., Honda, H., Sakai, S., Toyofuku, F.
gradient vector trajectory in fuzzy membership maps. sion MRI. 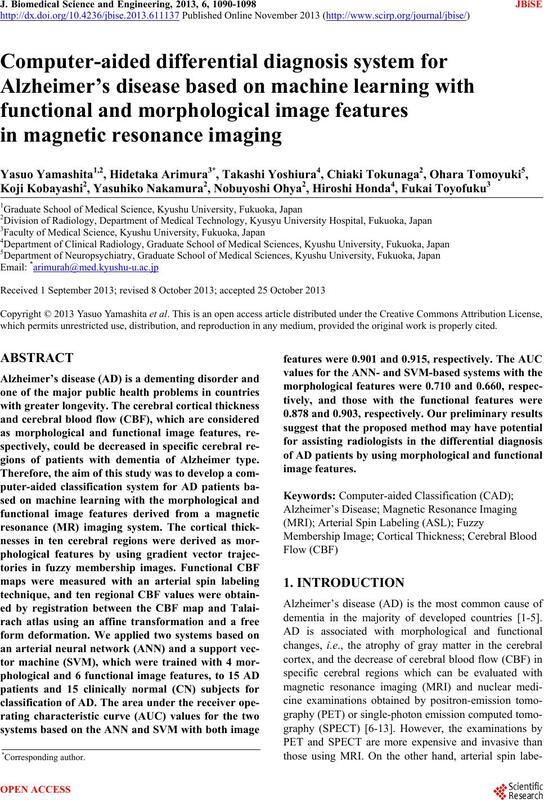 Magnetic Resonance in Medicine, 55, 219-232. Medical Publishers, Inc., New York. Joachims, T. (2008) SVMlight, Cornell University. Systems with Applications, 34, 1846-1856.